Welcome to the FIFA World Cup 2006 Polla. This is a game/pool in which you try to guess the results of the games in the 2006 FIFA World Cup. Use the links above to navigate the site, learn more and participate. Well, a close finish definitely! I feel like Germany, 3rd place is very respectable, but damn it I was so close to going all the way. Anyway, see you next time and congratulations!! 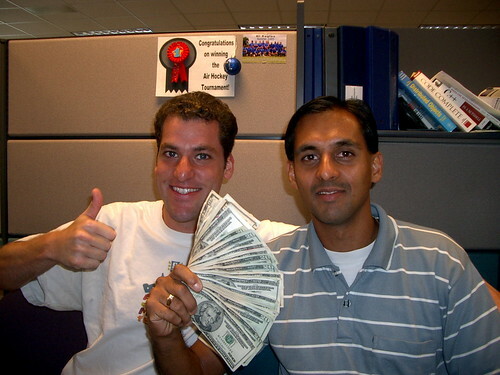 Anand has received his First Place prize. Congratulations! Congratulations to the winners of The FIFA World Cup 2006 Polla and thanks to everyone who participated. It was fun. And the second round begins! Now we have all had the chance to see the teams in action and can make more accurate predictions. Things remain tight in the Polla so a lot of people can still win (sorry ecoloco). Looks like a few participants couldn't handle the pressure and did not submit their second round results on time. Shame on them! Half the games have now been played. There are 32 to go, including the second phase of the tournament. Things remain very exciting, with fierce competition at the top of the table. As the first round comes to an end, you can jump to the submission form and start to fill out the results for the second round. Some cool enhancements to the Results table. Pages are now wider, to fit more columns. The total points column is now fixed, which makes for easier reading. Finally, the rank number is now fixed so that participants who are tied appear with the same rank. Germany VS Costa Rica is underway. The Polla is now closed. A total of 81 people entered. That means that $500+ go to the winner, $140+ go to the second place and $10 go to the last place, assuming this is how it gets split. The full table will be posted as soon as the game is over. Two big additions: 1. The Forum is now online! Go post how you feel about the fact that Mexico will be the new World Champion! 2. The Results page is now also online! This is where you go to see how you're doing compared to others. The actual scores for games will be added as they are played. With around 12 hours until kickoff, we have 61 participants that have already submitted payment... tell your friends, there is still time. Time is running out! Make sure your payment has been received and that you have sent in your results for the First Round. There's now less than a week to go! Over 50 people have already signed up but not everyone has sent their payment yet. For payment information, see the Rules page. Also, we're going to start sending reminder emails to the users, so if you plan on entering but haven't created an account, go do it now. You can still enter your results later. If you have friends who are thinking of joining but haven't created an account, please remind them to do it. I want to publically acknowledge the help received from Moi, who did all the design work for this website. If things look pretty, it's because of his CSS/HTML/design skills, not mine. There are now 27 people registered. Many more are expected! This should make for a nice, sweet First Prize. If you haven't done so yet, create you accound ASAP, even if you aren't ready to send in your results. Many enhancements to the submission form: You can now load and edit your previously submitted results. Also, now you can see when's the time limit to submit the results of each round. Start sending in your results! To avoid cheaters, you will need to create a user account with a password and will need to use that to submit results. Website is mostly in place, although not complete yet. Soon the website will be officially launched so that people can start submitting results... be patient. Since this thing is developed as we speak and will probably be changed throughout the World Cup itself, expect to see multiple changes all over the place all the time.